An attractive hilltop town, perhaps best known for its advertisement for a well- known brand of bread featuring the world famous Gold Hill. It was founded in 800 AD by the Saxon King, Alfred the Great, as a Burrh, or fortified safe place where the local populace could take refuge during the frequent Danish attacks. Situated on a spur of greensand rock which juts out into the Blackmore Vale, and surrounded on three sides by very steep cliffs, it was an ideal defensive site. The statue of Eros in London’s Piccadilly Circus was erected to commemorate the philanthropy of the 7th Earl of Shaftesbury. The shaft of his bow represents Shaftesbury and in particular the spur of rock. A few years later, Alfred built an abbey for Benedictine nuns to the east of the settlement which was to become the largest and wealthiest nunnery in the country. In the 10th century, the young King Edward was murdered on the orders of his stepmother, Elfrida, and his body was eventually buried within the precincts of the abbey. Forgotten after the abbey was closed down during the dissolution, Edward’s bones were discovered during excavations in 1930. Initially placed in a bank vault for safe keeping, they are now resting on the altar of the chapel of The Brotherhood of Monks of the Greek Orthodox Church at Brookwood. If the bones are ever returned to Shaftesbury they will finally be laid to rest inside a purpose-built altar inside the abbey ruins. 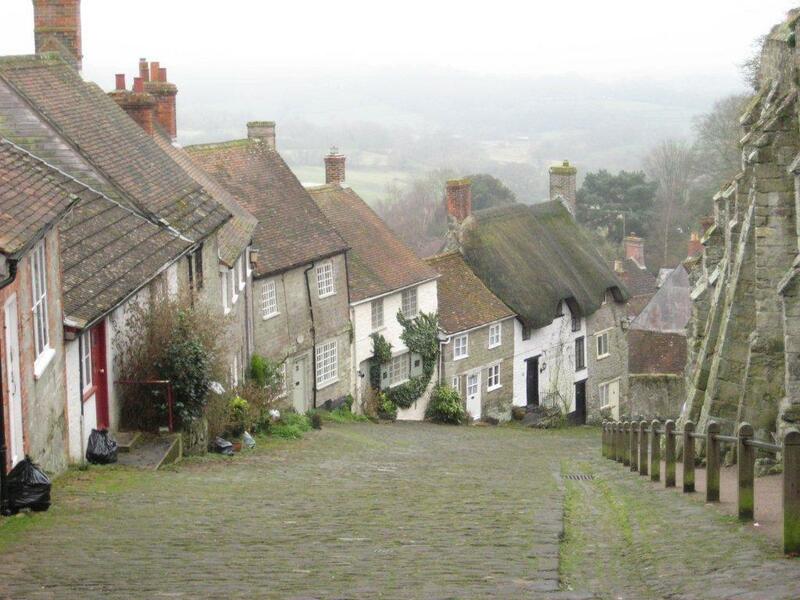 Shaftesbury was Thomas Hardy’s City of a Dream and known as Shaston in his books. He liked its bracing air and even recommended it as a health resort. Striking up a friendship with the Grove Family who lived in The Ox House, this house became Old Grove Place in his novel, Jude the Obscure. Lack of water in medieval times gave rise to a ceremony called The Byzant when Shaftesbury’s residents paid homage to The Lord of Gillingham with dancing and the presentation of gifts. This ensured their right to draw water from a spring on his land for the forthcoming year. This ritual continued until Shaftesbury obtained its own water supply in the1930s.